I have a wonderful privilege of gathering with some amazing women every other week to spend time talking about the things that we care deeply about. We discuss the season of life we are presently in and look for quality ways to navigate the many challenges and opportunities we encounter everyday. We talk about learning to say our “best yes”, to make sure we find ways to re-fuel in order to be the best version of ourselves, and we look at focusing on those things we consider the highest priorities at this time, using them as a good filter when choosing how to best use our time. These conversations are always rich and encouraging. Last night we spent our time talking about Legacy. We were all able to point to a person in our life who impacted us in a powerful way. Each one of us teared up simply talking about it! We could clearly see that without the gift of that person having touched our lives we would not be the women we are today. Then we turned our attention to the fact that each one of us could be “that” person in someone’s life. Down the road when a group of women gather, perhaps our name with be the one mentioned when expressing appreciation for key impact on their lives. This is what leaving a Legacy looks like. Lasting impact. Wow, does that mean that the choices, behaviours, values, and traditions we do ( or don’t) intentionally choose will be passed on to our future family? You bet! 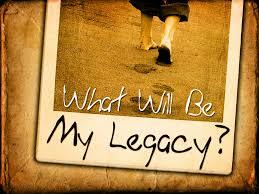 Think about your family of origin; is there a legacy you feel compelled to carry forward? Perhaps that legacy was unhealthy and you now have the chance to make choices that will turn it around in your generation. Choosing to leave a good and lasting Legacy requires intentionality, long-term vision, strong values, and time spent building rich relationships. We all have a choice as to the Legacy we leave behind. When I was a little girl we used to take long road trips in the big family car. My parents would get us up early; often before the sun was up to get on the road with the promise of syrup covered pancakes further down the road. Sometimes we would return from our trips late, late at night; everyone would seem to fall asleep~ Except me ( I can’t sleep in moving vehicles!) and my father who would always drive. As a little girl I had anxiety that my dad would also doze off as the driver so I would sit behind him and try to continually engage in conversation with him. I needed to know he was wide awake!! I think I thought I was somehow doing him a favor~~I am sure I must have driven him crazy!! I remember one particular time that he turned to me and said “You just talk too much! !” He had every right to say that; but my little heart was wounded that day. The OUCH of words. My father is a wonderful, wonderful man, one of my greatest supporters in my life, but he must have been so exasperated with his chatty daughter!! Interestingly enough though, I still remember how it made me feel as a little girl. I remember that it made me wonder if what I said held value. I can remember as a young mother mindlessly making statements to my sons in frustration or weariness. These words were irritable and negative. I am sure that these words hurt their feelings. These words did not bring “Life”. Looking back I probably owe them many apologies for things I said in haste! It’s funny how our words can impact lives so deeply, for good and for harm. Statements like ” don’t be stupid”, “you’re just not good at that”, “you’re a pest”, or “can’t you be more like ___________” are so harmful! These words cannot bear fruit in anyone. Sadly enough, sometimes we say these things to ourselves long before anyone ever says them to us!! These words cause us to become downcast and insecure; hopeless! Start a fire in our hearts or put it out! 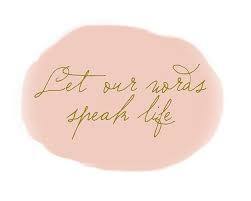 Let my words be life………………. However, the impact of statements like ” yes, you can!”, “You are full of potential, “I enjoy being with you”, and “sky’s the limit for you!” have equally as powerful an impact on us! These words breathe life helping us to dream and believe in the possibilities; hope filled! But if you need a little more back up the bible is full of verses on the power of the words we say ~ so it must be an important issue for us all to address! !